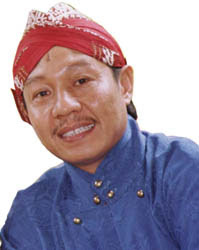 Indonesia mourn the loss of one of the funniest guy on TV, Basuki. His thick Javanese accent and naturally funny face shall be miss, together with the days where the whole family could watch a TV together after dinner, laughing the vernacular honest TV show about Betawi family in the midst of modernity . It was The Brady Bunch era of Indonesia’s TV history. Mas Basuki was a part of my early childhood memory. How I enjoyed watching “Si Doel” back then. A quick dinner and all six of us (included the house maid and dogs) hurriedly positioned ourselves in front of the TV, just in time for the opening song (“Anakkkkk Betawaiiiii….ketinggalan zamannnnn”). It always cracks us up when Mas Karyo (Basuki in a role of struggling Javanese door-to-door salesman who rent a room in Betawi family’s compound and have a on-off relationship with the landlord’s daughter) has a verbal fight over a fence with Mandra (the thick Betawi accented uncle of Doel who works as blue oplet driver). His mimic, body language and honest words gets through us everytime. I really want a re-run of that show, definitely the best long-running series Indonesia ever had or ever will have. Terima kasih banyak Mas Basuki. Wes ewes ewes…you’ll be missed!